Canine Partners for Life has found some hidden treasures while cleaning out our basement! For two weeks only, you will have a chance to take home unsold auction items from years past! Jewelry, artwork, collectibles, décor, and more…all for incredibly discounted prices! 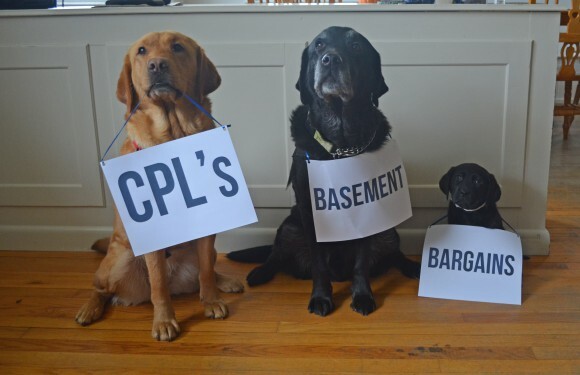 Proceeds will benefit CPL’s mission to provide highly trained service and companion dogs for individuals with physical, developmental, and cognitive disabilities. How: Visit the website, explore the items, click Instant Buy, and the item is yours! Come by CPL to pick up your purchase or have it shipped to you. [REGISTER] Register for the sale here. You can also text CPL17 to 24700. Once you are registered, you will receive a text and/or email with a link to your personalized Basement Bargains website. [SHOP] Browse through the items and click on the item you’re interested in to learn more. Want it? Click BUY NOW and it’s yours! [PAY] Click on the link you received from 247–00, go to the MY BIDS tab, and click PAY NOW. If you choose to not pay immediately, a reminder text will be sent on Fridays during the sale. [PICKUP] Items will be available for pickup at Canine Partners for Life (334 Faggs Manor Road, Cochranville, PA 19330) until March 10. If you are not local and would like to have your item(s) shipped to you, please contact Hannah Holton, Special Events Coordinator, at 610–869-4902 ext.225 to arrange shipping details and payment.